Department of Public Works trucks near the encampment on Friday night. Photo by Joe Rivano Barros. 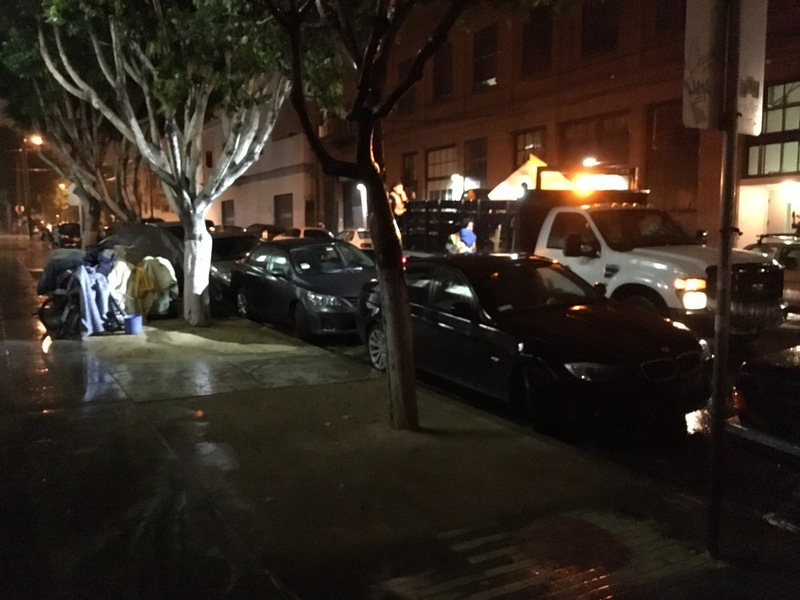 On Friday night in the pouring rain, Department of Public Works trucks cleared out trash near the homeless encampment where 45-year-old Luis Gongora was shot and killed by San Francisco police on Thursday, raising some fear among residents that the sweep was an attempt to scatter potential witnesses to the shooting. A Public Works spokesperson, however, said the trucks were not there to dismantle the encampment and that staff were taking nine people from the encampment to the Navigation Center. But according to Public Works, the timing of the cleanup effort was motivated by space opening up and inclement weather. “We were able to get spaces at the Navigation Center for nine people at the encampment,” said Rachel Gordon, a spokesperson for Public Works. Asked about the timing of the visit, Gordon said the Homeless Outreach Team had been at the encampment working to sign people up for the center on Thursday morning, before the shooting. She also said the weekend rain prodded Public Works to bring people indoors sooner rather than later. Police said staff from the outreach team called 911 to report a man with a knife. Officers responded and attempted to subdue Gongora with bean-bag rounds while yelling at him to “Drop it.” Officers said Gongora then lunged at them with a 13-inch knife and that they fired in self-defense, but witnesses said he wasn’t brandishing a knife and didn’t understand officers’ commands when shot by police. John Visor — one of the eyewitnesses to the shooting who contradicted the police account — said Public Works staff picking up trash on Friday night did not tell him to move from his tent and that he and his partner Stephanie Grant, another eyewitness, would be going to the Navigation Center the next day. “They just need to throw out the trash,” he said of the Public Works trucks, which left the encampment just before midnight. It coukd also have been motivated by President Obama’s visit. Optics not the best for Ed Lee and the City. Today, two brothers of Luis Gongora visited place he was shot. A neighbor talked with the brothers at about 1 p.m. on Saturday. The brothers learned of the shooting through news stories, they told the neighbor. A small memorial of flowers and signs marks the place. People and tents were gone. The wide sidewalk is still painted with flowers from the years people lived there. Another neighbor called it a stable community. She said that people deserve better than a tent on the sidewalk, but at least it helps to have stability. Are the people gone because the city offered them someplace better? Or did the city clear the tents to lose witnesses, hide people from the press, stop community organizing, and punish people for being poor? Saturday night the police came to the camp (not public works) and tore up the tents – ripping them, stepping in them. Tearing down people’s belongings even if they were not present to revive them. Now the whole encampment on shotwell is gone.